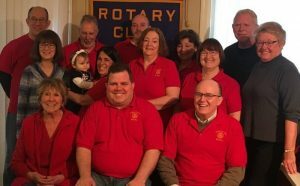 FULTON – Fulton Sunrise Rotary will host its 13th annual pork BBQ on April 7, from noon until sold out, at the Fulton Polish Home on West First Street. Promoting the BBQ are, in front from left, Carol Vescio, President Dan Farfaglia, Patrick Waite. Second row, Linda Rossiter, Peggy Donnelly, Abby Wiertzema, LaVerne DeLand, Ellen Nowyj. Third row, Dennis Merlino, Ed Garrow, Chad Whelsky, Donna Kestner, Doug Stevens. Each dinner includes a pulled pork sandwich, coleslaw and baked beans. Tickets are $8 and children younger than five eat for free. All proceeds are used for local community projects.